Claire Barnes is about to discover what kind of horrors lurk in the darkness of a deserted road. In tonight's episode The Highway, we follow Claire on her attempt to resume her journey after an unexpected obstacle appears in front of her car. "Midnight Scenes are the perfect Halloween weekend bite-sized games." "This tiny adventure is a perfect slice of The Twilight Zone." Turn off the lights and enter the mysterious world of Midnight Scenes: The Highway. The first in a series of short horror tales with adventure elements by Octavi Navarro; creator of Pixels Huh and artist on games like Thimbleweed Park and Photographs. Atmospheric black and white pixel art, inspired on horror and mystery shows from the 60's like The Twilight Zone or The Outer Limits. Eerie soundtrack written by Navarro himself. Welcome to a dimension of horror. Welcome to Midnight Scenes. This game is completely free, but if you enjoyed it and would like to help with the creation of future titles, you can support my work on Patreon. Thank you for playing and for your support! None of this would be possible without your help. Design, programming, art and music by Octavi Navarro. Font: BigRematch by Eeve Somepx. Holy crap this game was just good! I can't wait to play more! This game was amazing. I loved the Twilight Zone feel to it. Short and sweet. I liked the world you crafted here. It took me a few moments to realize the cursor highlighted on objects you could interact with. lol. Looking forward to playing the second episode one day in the future. This game won't run on Windows 7 with DirectX 11 installed. It complains that it needs DirectX 9.0c or later. Any ideas? This made me realize how old Win7 is and so I upgraded to Win10. The good news is the game runs now. But the bad news is that it runs so slow in VirtualBox it's not playable. Oh well. We're a Linux-only house here. Thanks for your help though. Just to let you know, I still use Windows 7 and the game runs perfect on it. I think you need to install the provided patch. I have an update for this. 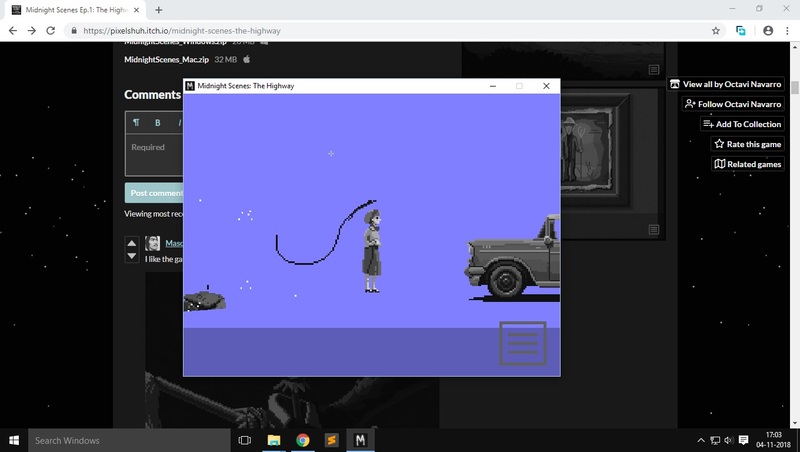 I was able to play Midnight Scenes Ep.1 on Ubuntu 18.04 with wine 3.0 and it worked perfectly. Interestingly, it wouldn't start at all on the same system with Proton 3.7 or 4.2. Possibly some config issues. The machine also has NVidia GTX 860M. A great and beautiful game! I liked the style of this game. It reminds me of an episode of the Twilight Zone. I will get around to playing episode 2 sometime! Thank you for the awesome and atmospheric game! We also played Episode two and had just as much fun there :), (video not up yet) do you have plans for an Episode 3? Hi there! I'm sorry you're having issues playing the game. Could you tell me what are your system specs so I can investigate a bit? Thanks! This game was really interesting, the visuals were great and the story had a nice build up. Not to mention that the sound track fits really well with the overall atmosphere of the game. Keep up the great work man, can't wait to try out more of these! Played the game and gotta say i loved it. Really cool mechanics as well as a well written story nice job. Hi! I wonder if you are interested in localizing the game into other languages like Chinese? I'm a grad student studying Translation and Localization in Middlebury Institute of International Studies, and would very much like to internationalize and localize Midnight Scene for free as a school project! This game was really good! I enjoyed the simple puzzles the game offered and I also appreciated the eerie atmosphere throughout the play through. I was constantly asking "what happened?" and "what's going on?" Not many mainstream games in this specific genre do that for me and it was nice seeing a game from an indie dev accomplish this. If you are having doubts about playing this game, I'm telling you that you don't have to worry about it. I recommend you play this game. It'll be worth it! Absolutely loved this game, I love the style. The franchise idea is very clever! Hey ! I love your dark , awesome games ! Really great style !! I'am organizing a small gaming event at the end of this month and i was wondering if you would be interested in showing your games there ? Its called The Overkill Festival ( www.theoverkill.nl ) Let me know mail is : aike@theoverkill.nl greets ! It looks really great. Any plans for a Linux release? i absolutely enjoyed playing this! also i'm such a fan of your pixel art/scene! i am super excited to see what you have coming next! HEY, I REALLY WANNA PLAY THIS GAME, BUT I GET THIS GRAPHIC GLITCH ON MY PC. ANY IDEAS? WHAT ARE THE MINIMUM SYSTEM REQUIREMENTS? WHAT STEPS CAN I TAKE TO PLAY THIS? I like the game and can't wait to play the second episode! Thanks! I really enjoyed playing this game the pixel art style is really well and i really liked the fact that its inspired by the twilight zone can't wait to play episode 2! So ready to play part 2. And The Library. I truley loved this game and await more with great anticipation. Thinking back I can't think of any constructive criticism, it was well thought out, the jump scares were good and the game itself is super atmospheric. Can't wait to play the next one when I have time and more after that! Thank you! I hope you enjoy Ep.2 as well!! Had so much fun recording both ep 1 & 2! Cannot wait until the next one comes out as well! This game is awesome! The pixel art is beautiful, the whole theme of the game is so nostalgic, and the twist at the end was entertaining! Disappointed that I didn't find out about it until now, but I'm hyped for Episode 2, which I'll be playing shortly. Just adding my name to the long list of players who have made a YouTube video of your charming game. Also, the horse totally got away with murder. loved every little detail this episode reminded me of a cross between the twilight zone and stranger things! Cant wait to play episode 2 ill be playing it tonight cant wait to see the next short story! This game blew me away. I've never played a game like this before but WOW. Reminds of the Twilight Zone!